If you are not familiar with the basic gameplay of Minecraft, start with a tutorial. 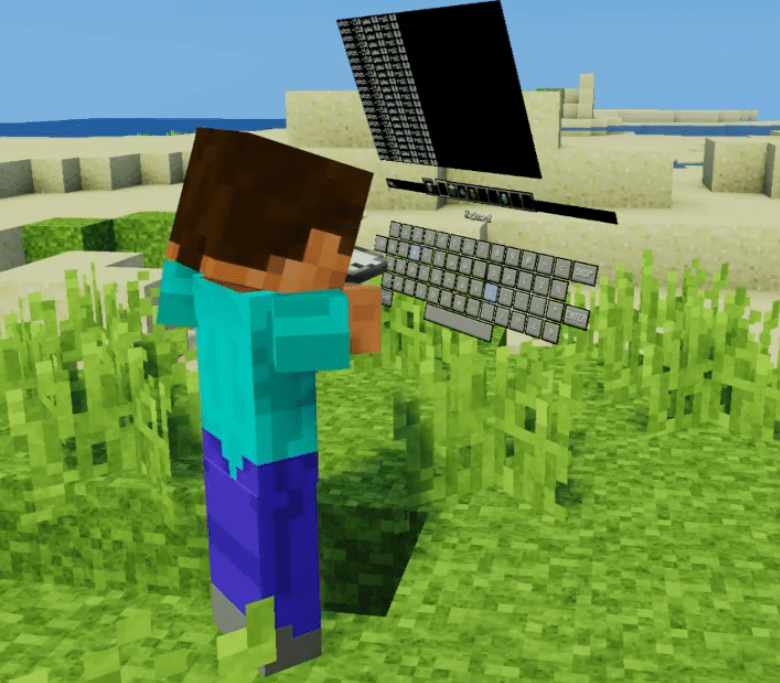 Minecraft is not a native VR game so control is implemented through mouse and keyboard simulation. For the best experience please make sure the game window has focus on your PC. In-game controls can be rebound in the VR Settings > Controller buttons menu. Vivecraft has a VR keyboard that can be used for typing into text boxes or pressing keyboard keys in-game. The keyboard should open automatically when clicking on a text box in Standing play mode. You can also bring up the keyboard at any time with a controller button combo. This can be rebound in the settings and the binding will supersede the default combo. The keyboard keys can be clicked on using both controllers and will respond to whichever button types are bound to either Gui Left Click or Gui Right Click. This defaults to the triggers and touchpads on the Vive, and index triggers and A/X on the touch controllers. Clicking the ‘Shift’ button will toggle the keyboard to the ‘Shift/Caps’ alternate key set. Holding ‘Gui Shift’ will also do this until released. This defaults to left grip on Vive and left hand trigger on touch controllers. The keys available on the keyboard can be changed by editing .minecraft/optionsviveprofiles.txt. Look for the settings KeyboardKeys: and KeyboardKeysShift:. The keyboard should support most Unicode characters. The keyboard will display a warning if the game window needs focus to operate and it does not have it. ‘Hand’ placement will float above your offhand. This is the default. ‘Wrist’ placement will put the HUD along the inside of your off-forearm. It will pop-out if you look at it. ‘Head’ placement will put the HUD straight out from your view at all times. This is the only view available for Seated mode. The in-game menu or inventory will always appear fixed in a position just in front of you. The GUI for chests, crafting tables, etc will appear floating over the block. If you find it clips behind blocks, turn off HUD Occlusion in settings. There are several other settings you can use to adjust the HUD to your preference. You can touch the hotbar slots to equip the item in that slot. This can be turned off in settings. Vivecraft supports both ‘Teleport‘ and ‘Free Move‘ styles of locomotion with many options. The move mode can be configured under VR Settings in either Locomotion Settings or Seated Settings, depending on your play mode. You can quickly switch between Teleport and Free Move on the fly by holding the “Pick Block” button for 4 seconds. Use the ‘Walk Forwards’ button to activate. Aim a parabolic arc at your destination and release to be teleported to it instantly. In survival mode teleporting will cause hunger and has an energy meter that refills over time. All horizontal movement, including knockback or being pushed by water is prevented. The ‘Simulate Falling’ option can be turned on or off to allow vertical movement such as jumping or falling in this mode. There are multiple options for how this mode works. Switch between in them on the Locomotion Settings. Several options also exist for mitigating motion sickness such as movement speed reduction, increased inertia, and FOV reduction. The following are the available sub-modes for free move. Controller: Uses the offhand controller pointing direction as forward and the 4 normal movement buttons. This is the default. If the movement button is bound to a button with an axis (such as a trigger) the movement speed will be variable. HMD: Similar to controller mode but uses the the VR headset look direction as ‘forward’. Run-In-place In this mode you hold the ‘Walk Forwards’ button and swing your arms to move. Forward is based on the direction of both controllers. Speed depends on how fast you swing your arms. Joy/Pad: This mode uses the offhand joystick or touching the offhand touchpad as analog movement. Direction is relative to the offhand controller pointing direction. Disables any buttons bound to the joystick or swiping the touchpad. The normal Minecraft movement keybinds are ignored in this mode. You can bind ‘Rotate Left’, ‘Rotate Right’ or ‘Free Rotate’ to a button to artificially rotate your view in the world. This allows for seated or 180° play with controllers. The rotation increment can be adjusted in the VR Settings. Turning the Rotation Increment all the way down will set it to ‘Smooth’ turning. The ‘walkabout’ rotation is also available as a button binding. Pressing this button will ‘freeze’ the world in place allowing you to turn around and continue in your direction via roomscale walking. Newer versions of Vivecraft supports a climbey-inspired form of jumping and free-climbing. Requires crafting some items. See this page for details. Vivecraft supports several types of roomscale movement. Each can be turned on or off in the Roomscale Settings. Requires Standing play mode. Walking around the play space will move your player in game. You can automatically walk up 1 block this way if the option is turned on. Ladders can be climbed simply by touching and climbing. Requires free-move or simulate falling: on. Swimming in water can be done by moving the controllers in a breast-stoke pattern. Look in the general direction you want to go. Requires free-move or simulate falling: on. Boats can be rowed by making rowing motions with the controllers. If you jump in real life your player will also jump. Requires free-move or simulate falling: on. If it doesn’t work right use the ‘Calibrate Height’ button on the in-game menu with the HMD on. If you duck in real life your player will sneak. If it doesn’t work right use the ‘Calibrate Height’ button on the in-game menu with the HMD on. You can eat by holding food or drink up to your face. Bow shooting is done 2-handed by drawing and releasing. Note: Texture packs may cause the arrow to appear rotated the wrong way. It is the same motion regardless of how the arrow looks. Playing Vivecraft in seated mode ignores all controller input. Movement is done via standard WASD on the keyboard. Your movement direction can follow either the crosshair or the hmd-look direction. Rotation is accomplished by moving the mouse to the left or right. The ‘keyhole’ size before rotation starts (as well as rotation speed) can be adjusted in the Seated Settings. Vivecraft adds the ability to hit blocks and creatures by swinging your hand. Your reach and damage are determined by the tool you are holding. Swords are best for combat and have a very long reach vs. creatures. Swinging harder will hit harder, to a point. Touching a passive mob (like a cow or sheep) will perform a right-click instead of attacking, unless you have a tool or weapon equipped. This allows feeding and mounting by touch. Can be turned off in the Roomscale Settings for piggy-slappin’. In the 2D game sneaking and sprinting have a visual cue of moving the camera down or changing to FOV. Neither of these is possible in VR so look for icons on your HUD to show status. The ‘rabbit’ indicates you are sprinting (via a dedicated sprint button, or double-tapping forward). The ‘eye’ icon indicates you are sneaking, either via the sneak button or using ‘roomscale sneak’ by ducking. Sneaking will also cause your hands to appear slightly transparent. Sprinting is 30% faster than normal running. Sneaking makes you harder to detect but also, and more importantly, prevents you from falling off ledges and will stop your downward motion while on a ladder. Sneaking also disables ‘roomscale walking’ so you can peer over ledges without fear. Reaching behind your head with the main controller will switch to the 1st hotbar slot (or back to the previously used one). Reaching behind your head with the offhand controller will swap items between your 2 hands. Can be toggled off in the Roomscale Settings. The VR Settings menu has many options to customize your play experience. Hover over each option to see what it does. Switch between Standing or Seated play. Seated mode ignores all controller input in favor of standard Minecraft keyboard and mouse control. Go into Video Settings and turn on ‘dynamic lights’ Torches held in your hand will emit light! Not a Vivecraft option but added by Optifine. In this menu you can map your motion controller buttons. Cycle through the list of available actions by clicking each button. Rotate Free: rotates the view while you hold the button down, works like a ‘pan’ button. Walkabout: freezes the world while you rotate in roomscale. Quick Torch: Places a torch if you have one available on the hotbar. keyboard(press): presses and releases the assigned keyboard key. keyboard-shift/alt/ctrl: presses down the indicated modifier key for the duration of the controller button press. You can assign up to 16 keybinds, in 2 sets of 8, to a radial menu that can be displayed in-game for quick access to infrequently used buttons. The Open Radial Menu keybind is not bound by default. The ‘drop block’ keybind is the recommended keybind to replace with the radial menu. You can pre-set up to 12 ‘/’ commands or just lines of chat. They will be available in the ‘Commands’ menu in-game. You can improve the look of the game a lot by changing the render scale to 1.5 and turning FSAA ON. Vivecraft supports several mirror options. These can be changed in Stereo Rendering or also by pressing F5 in-game. Single or Dual View is a copy of the headset view and has no performance cost. First and Third person show an undistorted view great for streaming or recording but comes at the cost of an extra render pass. Mixed reality is also performance intensive and should only be used for that purpose.